Ugh....a little tired today...my daughter woke up at 4am crying....got her back to sleep...then I swear we had a small earthquake so then I was really awake. I finally fell back asleep and then my son came in at 6:40am to start his day. So first up...coffee! Ahhh....much better! 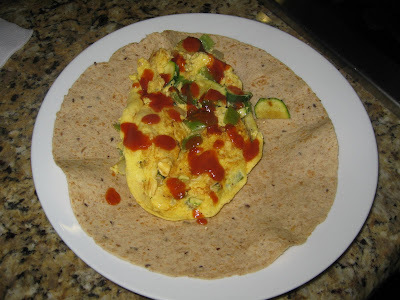 I decided to have an egg beater breakfast burrito this morning with zucchini, onions, taco sauce and Cholula. Usually this breakfast keeps me full a long time but not this morning. I decided to have a small snack of peanut butter filled pretzels before I grabbed the kids and went over to Lisa's house for Day 3 of P90X. Hubby is away so I had no choice. Fortunately her kids are a little older, and Lisa's hubby was home so the kids played while we did Shoulders/Arms and Abs. Whoo....my biceps are sore!!! I am feeling great though!!! We are really going to do this! Remind me of this positive attitude when day 60 rolls around and I'm ready to shoot myself. We came home and I recreated the tuna salad that I had yesterday. So freakin good and almost as good as yesterday's! I found out that the tuna I had yesterday had capers, celery, parsley, red onion and mayo. I had all those ingredients but the parsley. Capers in tuna? Who knew? 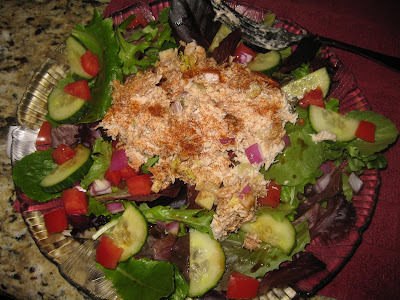 I put the tuna over a bed of mixed greens, cucumber and tomato and drizzled balsamic vinegar over it. Excellent!! A couple of hours later I was feeling whoozy so I decided some carbs where in order....so I had another handful of the peanut butter pretzels. I then took the kids to meet Lisa and her kids at this gymnastics place to play for an hour. Afterwards I took the kids to get frozen yogurt. I didn't have any because we were on our way to my sister in law's house next and I didn't want to use up points because I didn't know what we were having for dinner. It turned out that I didn't eat a lot at my sister in law's house anyway. I was busy getting my kids to eat/behave/etc so I just nibbled on some noodles and Trader Joe's mini chicken tacos. 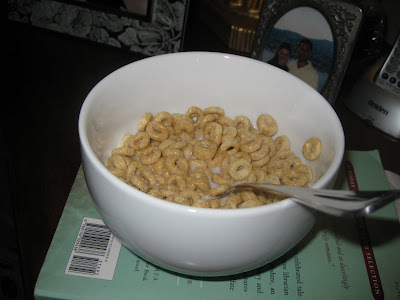 I realized when we got home that I was still hungry so after putting the kids to bed, I had a small bowl of Honey Nut Cheerios with almond milk. I forgot how freaking good this cereal is! I just took a hot shower and am blogging from bed. Now all I have to do is shut down the computer, turn off the light and put on this week's Biggest Loser and relax. Ahhhhh........gotta love it! I don't keep a ton of cereal in the house or I will sit and eat bowls and bowls of it. It is my weakness!